We Deserve a Tarantino Emoji! 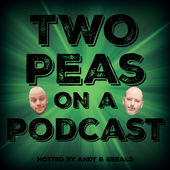 This week Gerald and his special guest, Nick (Epic Film Guys), discuss the new Dr. Who, the D23 Expo, R. Kelly’s latest “project,” World Emoji Day, Tarantino’s next movie, RIP George Romero/Martin Landau and Kid Rock for US Senate. Find our guest Nick on Twitter @EpicFilmGuys and on PodBean HERE. Find this week’s featured #PodernFamily shows on Twitter @ShakenNotNerd and @MGTPodcast. Intro/Outro: “Madness” by Muse. ℗ 2012 Warner Music UK Limited. All Rights Reserved.